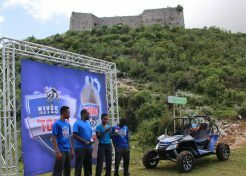 Kiyès Ki Toro is a Haitian television series that we developed specifically for Brana S.A. the national brewery in Haiti which is owned by Heineken. The series begins with auditions across Haiti to find the fittest and the most cunning. They then compete in various challenges that require strength, speed and ingenuity to find out who will be the Toro. In our second season, challenges were set against the backdrop of Fort Drouet, a long-lost fortress 4,500ft above the Gonäives Valley, and at St. Mathurin in the South under a 120 foot waterfall. In viewer surveys, 58% of all viewers in Haiti had watched the show, and 100% of these said they would watch the next season. We also had excellent social media integration and response, including a viewer’s wild card for return in to the show.